A group of well-known actors and arts practitioners have revisited one of the darkest periods in Belfast Celtic's history in advance of a specially staged performance later this month. Belfast City Council's chamber - a crucible for heated political debate over the years - was the venue for the recording of the soundscape for Lish and Gerry at The Shrine, a new drama written by Padraig Coyle, Chair of the Belfast Celtic Society. They are recreating the acrimonious exchanges in the Stormont Parliament of 1949, some of them in the wake of the violent scenes of Boxing Day 1948, when a riot at Windsor Park left Celtic's striker Jimmy Jones badly injured in hospital. From the Council’s opposing Unionist and Nationalist benches, the characters of the respective Honourable Members blazed their way through extracts from 60 year-old debates. The rehearsals were under the keen ear of director Jackie Doyle, who has worked at the Lyric Theatre and was one of the founders of Prime Cut - one of Ireland's most successful independent theatre companies. Padraig Coyle said; "Hansard perfectly preserved the debates in the Stormont chambers in the wake of this infamous game and they are proof that some of those in political office at the time were almost as badly behaved as the people who took part in the rioting at Windsor Park. 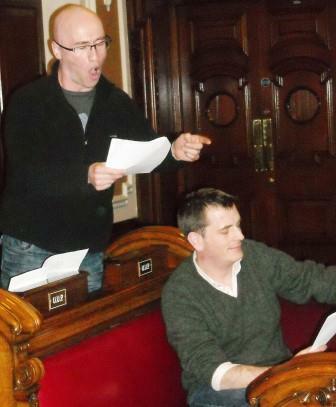 Recreating acrimony - Tim Loane (left) delivers his lines with venom from the Unionist benches at Belfast City Hall, while Hugh-Odling Smee readies himself to roar his support. The actors included Tim Loane, who directed the Oscar-nominated short film Dance Lexie Dance. His distinguished stage and screen appearances have now been overtaken by an illustrious screenwriting career, which includes the Channel 4 hit series Teachers, which he created. Alongside was Frankie McCafferty, best known for his regular appearances as Liam, one of the two duckers and divers in the BBC’s drama series Ballykissangel. Young actor Ryan Crown took on the challenging role of Labour MP Jack Beattie, while other voices were supplied by Eugene McNamee representing Tinderbox Theatre Company, Stephen Douds of the BBC and Hugh Odling-Smee of Kabosh Theatre Company. Healing Through Remembering, a cross-community project which encourages voices from all traditions to deal with legacy issues, has helped sponsor the event and will facilitate the after-show discussion among the large invited audience. Padraig continued; "These recordings will add a real contemporary flavour to the play, which will be performed in the old Senate Chamber at Stormont on February 17. 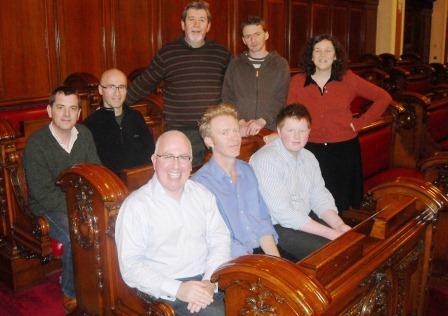 Voicing the past - Clockwise from Top - Padraig Coyle, Frankie McCafferty, Jackie Doyle, Ryan Crown, Eugene McNamee, Stephen Douds, Hugh Odling Smee and Tim Loane. "It's a powerful story about Belfast Celtic's Protestant manager Elisha Scott, played by Lalor Roddy, and his Catholic friend and rival Gerry Morgan, the former player and trainer of Linfield and Northern Ireland. He’s played by Vincent Higgins. The play began as a monologue about Scott, which acted as a springboard for discussion at a night of reminiscence at Windsor Park last April. For a second similar, but much bigger event in the Viewing Lounge of Windsor Park in October, I developed the character of Morgan to extend the scope of the piece. "Conall McDevitt, the SDLP’s MLA for South Belfast saw it then and found it so powerful that he invited us to bring it to Stormont, so his fellow Assembly members could also see it. He brought on board cross-party support from Danny Kennedy MLA, the Ulster Unionist Minister for Employment and Learning, and Chris Lyttle MLA of the Alliance Party ." All three events have been organised and supported by the Irish Football Association, through it's EU Funded Football for All Programme, where Community Relations officer Michael Boyd is the driving force, seeking to tackle racism and sectarian at both international and local levels of football.